)In a summer mountainous environment, tie off on a cliff face while conducting a seat-hip rappel, in accordance with the references. 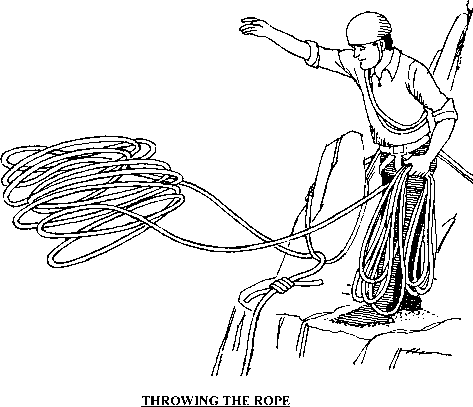 (10) In a summer mountainous environment, retrieve a rappel rope, in accordance with the references. ^HWith the aid of references, state orally the criteria involved in site selection for a rappel site, in accordance with the references. ^HWith the aid of references, state orally the duties of the rappel point NCOIC, in accordance with the references. ^IWith the aid of references, describe orally the different types of rappels, in accordance with the references. QEIn a summer mountainous environment, rappel down a moderate slope using a hasty rappel, in accordance with the references. 9EIn a summer mountainous environment, execute a seat-shoulder rappel, in accordance with the references. ^EIn a summer mountainous environment, rappel down a cliff face at night using a seat-hip rappel, in accordance with the references. ^P)With the aid of references, state orally the duties of the first man down a rappel rope, in accordance with the references. ith the aid of references, execute the commands used between a rappeller and his belay man when conducting a rappel, in accordance with the references. ^In a summer mountainous environment, tie off on a cliff face while conducting a seat-hip rappel, in accordance with the references. 4| METHOD/MEDIA. The material in this lesson will be presented by lecture and demonstration. You will practice what you have learned in upcoming field training exercises. Those of you with IRF's please fill them out at the end of the period of instruction.